Jeff will be giving a reading Thursday evening (3/19/09) at 7pm 7:30pm at Powells downtown. Hope to see you there! 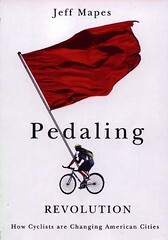 I was fortunate to be able to wheedle a review copy of the forthcoming book: “Pedaling Revolution” from the publisher (by invoking the undying interest of you, my loyal readers). I’ve been eagerly anticipating this book since I was part of a Portland delegation to Amsterdam along with the book’s author, Jeff Mapes of Oregonian fame. As befits a journalist of Jeff’s reputation, the book is journalism, not advocacy. But the book enthusiastically tells the story of the nascent rise of cycling in this country and contrasts it effectively with an insightful analysis of European cycling. The book has chapters on Portland, Davis, New York City and Amsterdam, but also looks at a variety of other cities on both continents. This book is a must read for anyone who wants to be an informed advocate for cycling. The book is due out in March (Oregon State University Press, ISBN-13: 978-0870714191). It is available for pre-order on Amazon, but does not yet appear to be available for pre-order at Powells, although they will notify you when it is. Perhaps we should retrofit Tri-Met busses with hitches on the rear bumper so bicycles can be towed behind? The cyclist would then have a choice of a) riding abourd the bus (requiring a full fare), or b) riding on his bicycle (at a reduced rate). Those without adequate helmets and kneepads will be required to ride the bus. The book has been in stock at Powells for a couple weeks now. It’s a good read.